The loyal Texas dog found waiting beside his fallen friend this week will be reunited with his family, animal rescuers said Tuesday. Heart-wrenching photos of a Great Pyrenees dog found standing guard by his deceased friend's side near the Dallas-Fort Worth National Cemetery Sunday went viral. "He's obviously being loyal to a friend who passed away and he’s mourning," animal advocate Julie Fennell said. He was taken to Dallas Animal Services in hopes his family would be found. 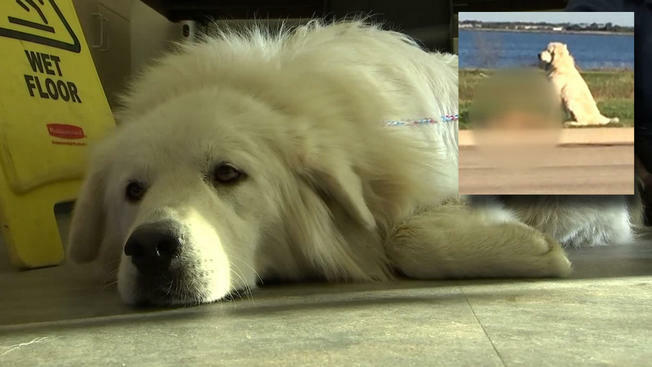 On Tuesday, DAS reported they'd found the Great Pyrenees' family and that his name is Brian. They also learned the deceased dog belonged to the same family and was a 1-year-old Shepherd mix named Marley. Brian and Marley disappeared from the family home Sunday when someone accidentally left the garage door open. Marley, it is believed, was killed when he was hit by a car. The family said it was grateful for the support of rescuers, DAS and the community. Brian will be microchipped and neutered before returning home.